On the Eastside, prices dipped 3 percent over the past year, to $910,000, though prices remained virtually unchanged from a month prior. Matt Holt and his fiancé began looking for a house a year ago when the market was still sizzling, only to find 15-20 offers on every house they put an offer on. They went as high as $60,000 over asking price on a house in Renton last year and agreed to waive the contingency that would have allowed them to back out of a deal if an inspection showed the house needed work — but they still didn’t get a house at the time. Renter Bill Sablan has noticed lenders getting more flexible, willing to give mortgages for as little as 5 percent down (the average locally is about 20 percent) and to count restricted stock units toward assets before they even vest. 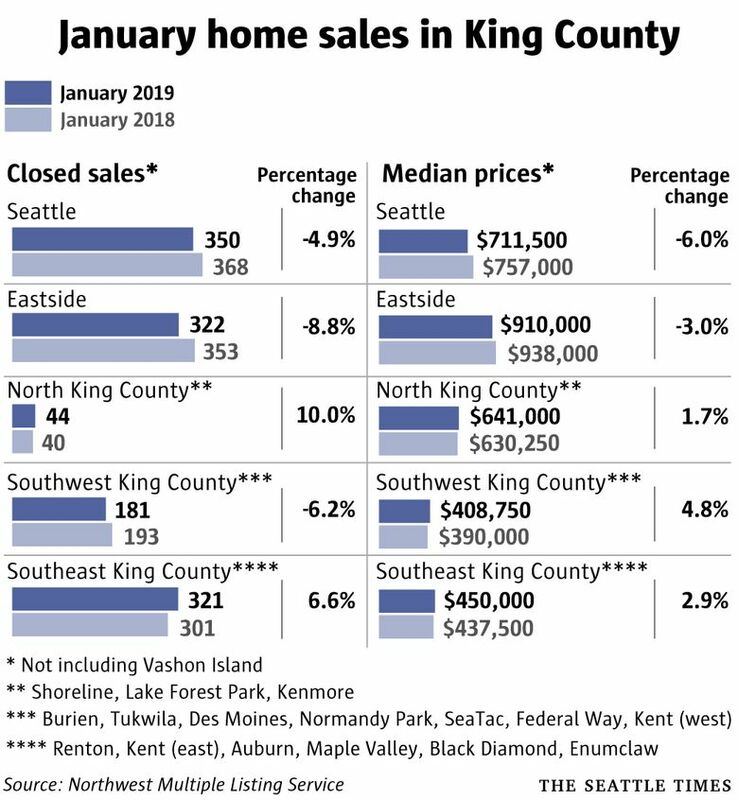 Home prices continue to fall here at the fastest rate in the nation, but it hasn’t made the Seattle area affordable or do much to counteract the soaring prices during much of this decade. From the bottom of the housing bust in 2012 to the peak of the market last spring, prices soared 136 percent. Since the market started to slow, prices have dropped a total of 16 percent in the last eight months. Looking at trends in specific neighborhoods this time of year can be tricky because home sales volumes are low, leading to heightened volatility. 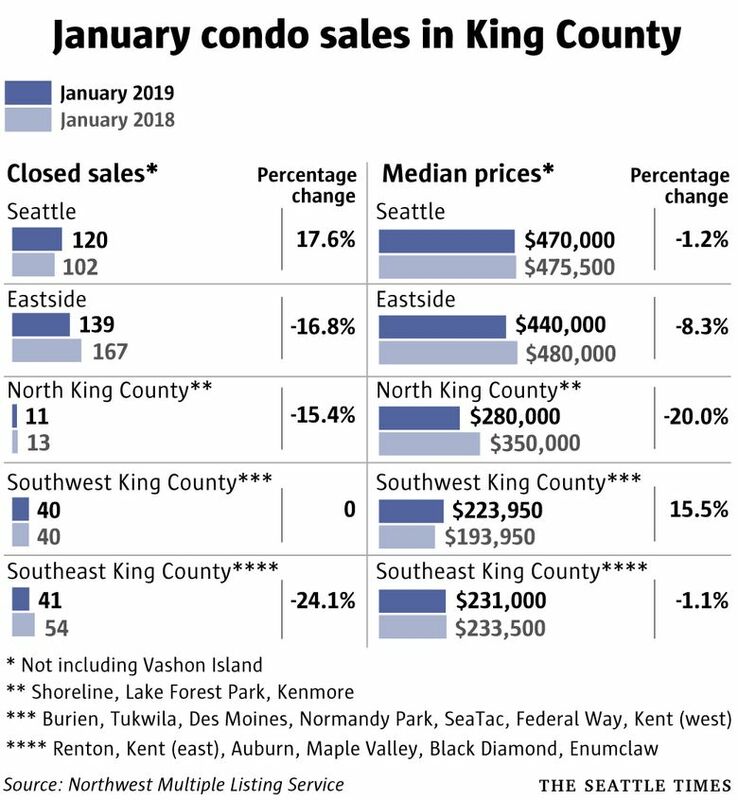 But prices over the past year dropped the most in West Bellevue (down 28 percent), North Seattle (19 percent), Southeast Seattle (18 percent), East Bellevue (12 percent) and Jovita/West Hill Auburn (11 percent). The condo market also continues to cool. Countywide in the past year, condo inventory has tripled and prices ticked up less than 1 percent, to $384,000. As has been the case for several months, the market in Snohomish County remains slow: The median single-family house sale of $455,000 was up just 1 percent in the past year, and well below the high of $511,000 reached last spring. 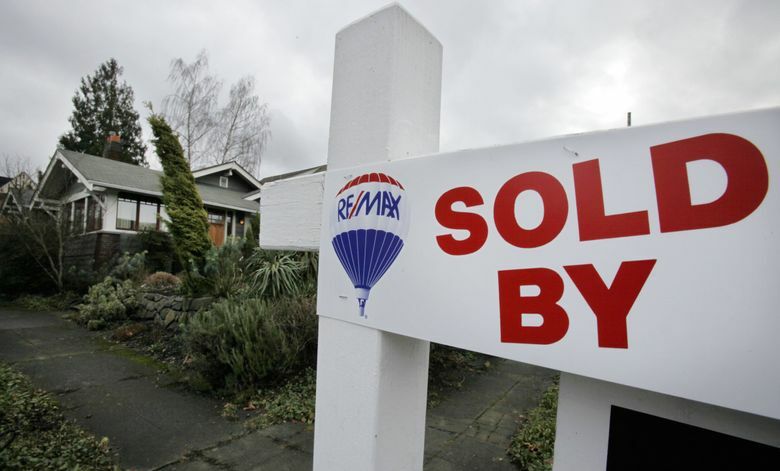 Inventory has also doubled in the past year in Snohomish. But things aren’t changing quite as fast in the rest of the Puget Sound region, where homes are still more affordable. 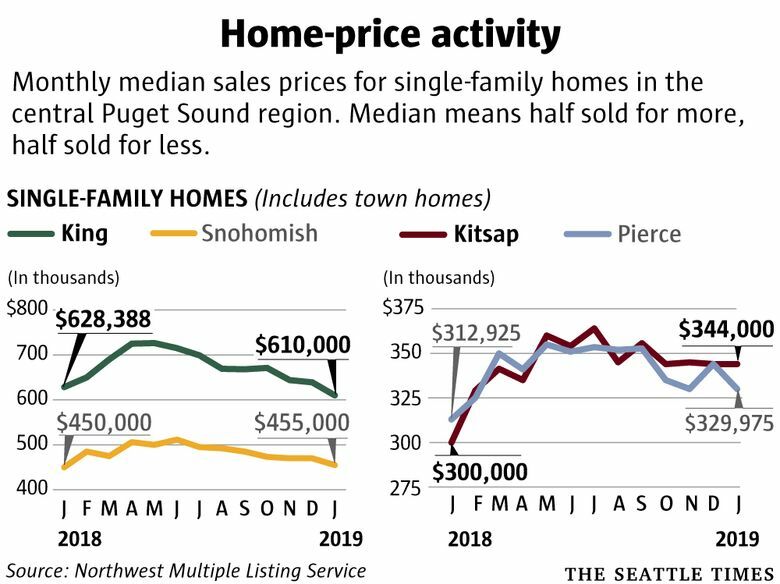 In Pierce County, the median home price of $330,000 was up 5.5 percent in the past year, while in Kitsap County, prices soared 14.7 percent in a year to $344,000. Hear Seattle Times real estate reporter Mike Rosenberg discuss the local housing market – including home prices, zoning and redlining – on KVRU 105.7 FM on Friday at 5 p.m. It will be livestreamed at KVRU.org.